A leading historian, and Winston Churchill’s official biographer, tells the complete story of Israel’s birth and development as a nation. Just over 100 years ago, Theodor Herzl launched the Zionist movement. Fifty years later, after the Holocaust, the State of Israel came into being, established so that Jews anywhere in the world could have a homeland. In the years since, five wars have tested Israel's ability to survive. Influxes of emigrants enhanced the country's cultural riches yet strained its social fabric, even as Israel's Arab neighbors sought to redress their own grievances through violence. 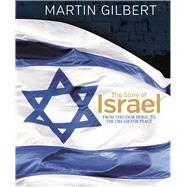 Now, just as Israel celebrates 70 years of independence, the nation’s fascinating story is told by renowned historian Martin Gilbert, complete with images of important historical documents. Martin Gilbert was Winston Churchill’s official biographer. He was in Israel during the October War of 1973 and came under Syrian shellfire on the Golan Heights. His books include Arab–Israel Conflict Atlas (Routledge, now in its eighth edition) and History of Israel (Black Swan). His Jewish History Atlas (Routledge) is a classic work of reference. He was a visiting professor at both Tel Aviv and the Hebrew University, and spent part of every year in Israel. He has also written histories of the First and Second World Wars, of D-Day, of the day the war ended (in 1945), and of the Holocaust.